The interwebs are full of predictions of doom for Big Box retail- Amazon continues to surge, Macy’s and Sears closing stores, etc. What the Sears catalog had been to rural general stores, so to is Amazon to retailers of today. Now Big Box may strike back by finding its online footing and value in their physical locations, and thus news of its death may be greatly exaggerated. But then again, maybe not. Free two-day delivery was impressive, but two-hour delivery is tough to beat. Fasten your seat belt because this ride is going to get very turbulent. Let’s assume for a moment that Big Box retail continues to flounder as more and more Americans discover the delights of e-commerce. What becomes of all of that real estate? A recent New Yorker article on new agricultural techniques suggests one possibility: vertical farming. The practice involves stacking of crops in trays indoors and spraying their roots with mineral enhanced water rather than planting them in soil. Based upon the information provided in the article and my Wilson Middle School Algebra, this technique uses 9% of the freshwater of that utilized in conventional farming to produce the same amount of crops. The technique is also hyper efficient in the use of land, potentially freeing large amounts farmland for other uses. In addition, since you can utilize this technique basically anywhere, sellers can reduce shipping costs. If government policy ever had an attack of reason and allowed market forces to play a greater role in agricultural water use, the attractiveness of these techniques would be even greater. The company featured in the New Yorker article is operating out of Newark New Jersey. The price of real estate is the likely reason for a Newark as opposed to a Manhattan operation. Climate controlled indoor space will be needed to make this practice thrive, and as luck would have it, a great deal more of it may be looking for different uses. Of course, this speculative piece may seem entirely misguided a couple of decades because someone figured an even better use for the space. I’ve heard for instance that a charter school operator converted a Target into a very nice school facility. Perhaps agriculture will follow a different path. Let’s see what happens next. This entry was posted on Tuesday, January 24th, 2017 at 8:17 am and is filed under Uncategorized. You can follow any responses to this entry through the RSS 2.0 feed. You can leave a response, or trackback from your own site. Higher Education may have a new future under Hubbard. Is it really the case that no reader of these blogs knows anything about him? Allan Hubbard from Lumina has been nominated to be DeVos’ Deputy Secretary, in order to manage the USED for her and to revise the Higher Education Act–due for re-authorization this year. I like that example for another reason germane to this blog. Google killed its vertical farming effort last year. 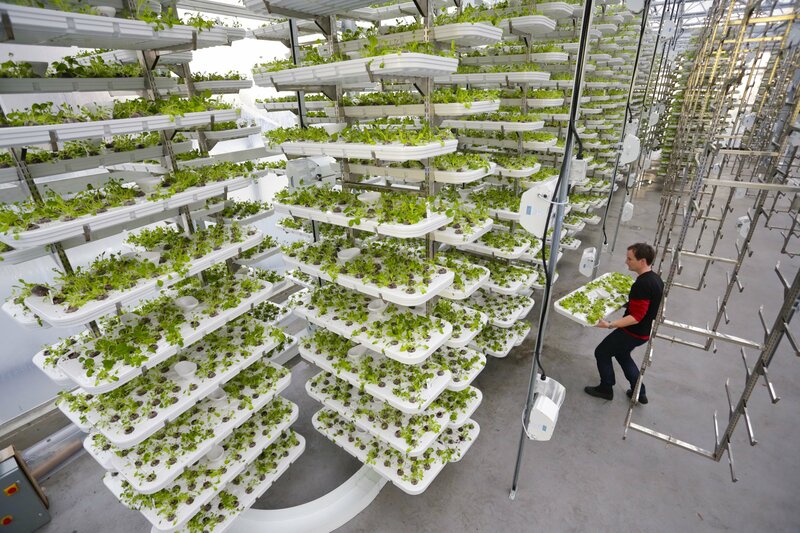 Vertical farming was 1 of 100 such moonshot projects that Google started and stopped. Great failures! If Edu were a real market, would perhaps be many well-capitalized private sector moonshots to improve learning. Instead, at any given time, what does our sector have? Just a couple moonshots (SIG, Gates teacher quality, etc). Feels to me like our sector often misses the Big Pic. Up front, it’s not that vertical farming is so obviously better or worse than a teacher quality bet. The problem is the shortage of bets! If you have a basket of moonshots like Google, you can cheerfully shut down the losers. It’s part of the plan. If you have a real market and many players each with one big bet, that works too – the losers won’t shut down cheerfully, but the cash runs out. Another way to achieve a basket of moonshots. If you have just one big bet and no market, tempting to simply insist “that one thing” is working….as has been chronicled on this blog. The challenge is that a lot more people have to be highly risk-tolerant if you want to do a “moonshot” in education v. in agriculture or other traditional business sectors. Hi Mike — I don’t think moonshots are the right strategy. Most progress in business as well as politics occurs incrementally. What we need are systems that make that incremental improvement possible and rewarded. Markets are particularly well-suited to do that. Imagine this: parents send their children via self-driving cars to the local education mall where there is a central administration that keeps track of a child’s location and well-being, along with her forms/transcripts, but otherwise her family chooses from among dozens of different providers located throughout the mall. At the food court, several different vendors offer their fares just as they do at the malls today, though most of the parking lot has been converted into athletic facilities. For math, she chooses a Saxon Math workshop. For literature, it’s Great Books. She’s learning Mandarin Chinese via an online course at the language lab. For PE, she’s practicing kung fu. For art, she attends a rotating painting and pottery course this semester. She’s being tutored in the harp. Each course is offered by a different vendor and her parents pay for these various services with their ESA. Might sound crazy, but with widespread use of ESAs (and declining shopping malls due to Amazon, Jet, Overstock, etc. ), I think this just might be the future of education.